There are two oil refineries located on March Point in Anacortes, Washington. 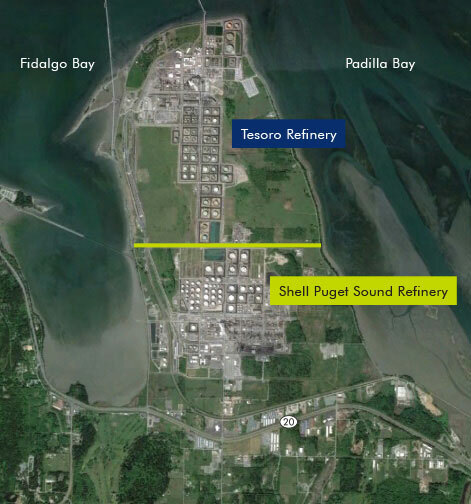 One is the Tesoro Anacortes Refinery, and the other is the Shell Puget Sound Refinery (PSR). This article will feature information on the latter, Shell PSR, due to its current expansion proposal and local activism efforts concerning the proposal. Information discussed includes Shell PSR history and operations, expansion plans at the refinery, current environmental concerns, and local responses to the expansion. Information on Tesoro’s refinery, their capacity and operations within the fossil fuel industry, can be found here. The map above shows an aerial view of both refineries at March Point. The Shell PSR oil refinery, previously owned by Texaco, has been in operation at March Point since 1958. This area is part of Skagit County, Washington and was detached from the adjacent Swinomish Reservation. The refinery processes around 145,000 barrels (5.7 million gallons) of crude oil each day. Most of the crude oil previously came from the Alberta Tar Sands through oil pipelines (See Kinder Morgan Pipeline; Alberta Tar Sands), but as limitations have been set on how much crude can be shipped via pipeline, Shell PSR began shipping in crude from Alaska’s North Slope via ocean tankers. Now Alaskan crude is diminishing, and the refinery is exploring new ways to keep operations at the existing capacity of 145,000 barrels per day (Shell; Kent). The location of the refinery on Washington’s coastline makes it an ideal location for the export shipments of Canadian oil to foreign markets. Now that the ban on the export of U.S. crude has been lifted, it can be shipped out to various markets (See Asian Energy). The image below shows the location of Shell PSR on the Salish Sea in Anacortes. Refining 5.7 million gallons of crude a day means Shell PSR is one of the top polluters in Washington State (Associated Press). In 2014, Shell PSR reported over 1.8 million metric tons of greenhouse gas emissions—down from 2 million metric tons in 2013. The process of refining petroleum produces just over a fourth of those emissions. The remaining emissions are from stationary combustion and the flaring process (EPA). Gas flares, also known as flare stacks, burn excess hydrocarbon gases that accumulate during the refining process. These flammable gases are then burned off and released into the atmosphere as carbon dioxide (Cheremisinoff). Flaring is considered a necessary safety measure at refineries, but at such a large scale, the resulting carbon emissions are extensive. Approximately 1.3 million metric tons of Shell PSR’s carbon emissions can be attributed to flaring in 2014. When considering the scale of these greenhouse gas emissions, keep in mind, this is only one of 140 operable oil refineries in the United States (EIA). There is an initiative being put forth by the World Bank to end all routine gas flaring by 2030 (World Bank). Here is an image of March Point at nighttime during the flaring process (note the Great Blue Heron in the foreground). Due to declining crude oil shipments from Alaska, Shell PSR is looking to build an oil-by-rail facility onsite to receive crude oil via trains from the Bakken Shale Formation in North Dakota and Montana (See Bakken Oil Shale Basin). The expansion project would include extending the BNSF railway onto Shell PSR’s property, building an onsite unloading facility, installing equipment and pumping facilities, and constructing retention ponds and various other safety measures in case of spills (See Oil Tanker Spills). The expansion would not increase the refinery’s production levels, but the region would see an increase in oil train traffic. These oil trains are up to 1.5 miles long and carry around 102 tank cars per train—each car filled with highly volatile Bakken crude oil (See Shale Oil). Shell PSR claims no more than six of these long trains would pass through the area weekly (Enviroissues). The project would also require over 1.1 million cubic yards of earth and soil to be removed from March Point and relocated elsewhere. Onsite wetlands would be impacted, and mitigation efforts are being considered (Cauvel). The proposed mitigation site is on diked land across from Padilla Bay, approximately two miles east of the proposed expansion site. A copy of the most recent mitigation plan can be found here. The yellow outline in the image below details the direct area that would be affected by the project. Local communities are showing concern over Shell PSR’s oil-by-rail proposal. Other refineries in the area already receive Bakken’s volatile crude by rail, but recent issues with fossil fuel shipments have citizens and environmental organizations very concerned about an influx of oil train traffic (Farrell; Sussman). The local Swinomish and Samish tribes are also concerned about the project’s potential impacts on climate change, local waterways, and their culturally-accustomed fishing grounds (See Swinomish). Moreover, March Point is technically part of the Swinomish Reservation according to the Point Elliot Treaty of 1855. A Washington territorial judge took this land from them in 1872 in a ruling the tribe still considers to be illegal today (Rector & Silverstein). Below is a photo showing key vulnerable areas in proximity to Shell’s proposed project, including the March Point Heronry and Padilla Bay’s National Estuarine Reserve. The concerns are many, and with all the possible impacts involved, an Environmental Impact Statement (EIS) is now required. Washington’s State Environmental Policy Act (SEPA) requires an EIS for any project that has probable and significant adverse impacts to the environment. Skagit County initially stated the oil-by-rail project could go forward without any detailed review, but after a lawsuit brought on by EarthJustice and several local environmental groups, the EIS is now required for Shell PSR’s East Gate Rail Project. Environmental Impact Statements are very detailed environmental reviews that provide an opportunity for the public to get involved and submit comments on their concerns. It also provides an opportunity for local governments to require significant mitigations and/or turn down the project proposal altogether. Skagit County and Washington State Department of Ecology will be working together to prepare the EIS. For more information on SEPA or the EIS process, please visit this page on the Washington Department of Ecology website. In the image below, community members express concerns about oil trains at a rally outside the Lynnwood Convention Center in Lynnwood, Washington. During the EIS process, one of the first steps is to determine the scope of issues and concerns that need to be addressed—this is called the scoping phase. The public may submit official comments during the scoping phase, and once the scope is determined, the lead agencies prepare a draft EIS. Once the draft EIS is released the public has another opportunity to submit comments. The scoping phase has ended for this project, but the Department of Ecology and Skagit County are working to prepare a draft EIS. When the draft EIS is released there will be another period for comments and public hearings. To stay updated on Shell PSR’s East Gate Rail Project, you can sign up to receive project updates through ShellRailEIS.com. The draft EIS is expected sometime in fall of 2016. A Scoping Report is already available here. In addition to paying attention to the EIS process and submitting public comments, another way to get involved is by joining and supporting local coalitions and environmental groups such as Stand Up To Oil, ShellNo, ForestEthics, Evergreen Islands, Friends of the San Juans, Friends of the Earth, RESources for Sustainable Communities, 350 Seattle, and the Washington Environmental Council. Nearly all of these groups have newsletters, emails, and social media accounts to help you stay up-to-date on current issues. Supporting these organizations through volunteer work, donations, and community support equips them to stand up to big oil companies and spread awareness about fossil fuels and other climate concerns. To hear more about environmental groups, see Environmentalists. Cheremisinoff, N. (2013). Industrial gas flaring practices. Hoboken, NJ: Scrivener Publishing. EIA: U.S. Energy Information Administration. (2015). Petroleum and other liquids: Number and capacity of petroleum refineries. EIA. Enviroissues. (2015). Shell Anacortes rail unloading facility: Environmental impact statement. Farrell, S. (2013, July 9). Death toll from Quebec train derailment feared to be in the dozens. Huffington Post. Kent, S. (2015, September 28). Shell to cease oil exploration in Alaskan arctic after disappointing drilling season. Wall Street Journal. Rector, T. (Producer), & Silverstein, A. (Director). (2008). March Point [Motion picture]. Seattle, WA: Longhouse Media. Shell in the United States. (2015). Puget Sound Refinery. Shell in the United States. (2015). Shell Puget Sound Refinery East Gate Rail Project. Sussman, Anna Louie. (2014, November 11). Alabama oil-train derailment raises questions about crude shipment safety. Huffington Post. U.S. Environmental Protection Agency (EPA). (2015). EPA facility level GHG emissions data. World Bank. (2015). Zero routine flaring by 2030.